What do you know about the hula? It’s a Hawaiian dance. You know that hula dancers are graceful… did you know that they are magical, too? 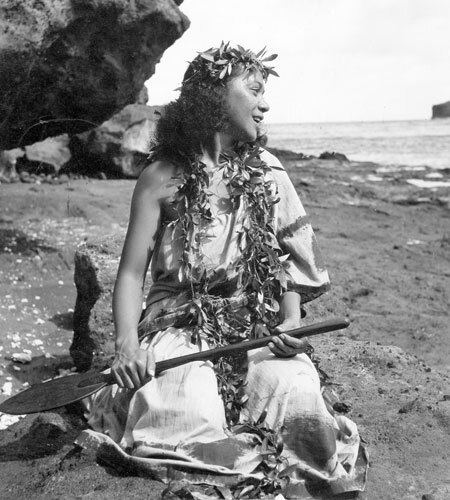 Iolani Luahine was the last of the great Hawaiian hula priestesses. She came from a traditional Hawaiian family, and hula was in her blood. Her aunt was a dancer for King Kalakaua’s and Queen Lili’uokalani! From a very young age, Iolani’s magical skills were obvious. She was given the name Iolani after io, the Hawaiian hawk. She would prove to be as wise and sharp as her namesake. When Iolani grew up, she became a well-respected hula teacher. In the 40s and 50s, there was a lot of interest in the hula. However, many people didn’t want to learn about the traditions, they just wanted to do the funny dance with the wiggly hips. Iolani took a strong stand against the Hollywood version of the hula. The hula was more than just a dance, she said, it was a ritual, a philosophy, and a way of life. One day, when the Queen of Tonga came to visit Hawaii, she witnessed the magic of Iolani. When the Queen went to visit Iolani at her home, she called each of the animals to come pay their respects. One by one, Iolani’s dog barked, her cat meowed, her rooster crowed, her pig oinked, and they each bowed to the queen! Each year, the Iolani Luahine Hula Festival takes place at the Hulilee Palace to honour her memory.